Supports Weight. Well Constructed. Easy To Use. Stores Easily. Safe. Lightweight. Lightweight. Supports Weight. Well Constructed. Easy To Use. Stores Easily. Safe. This easily folds down and out of the way when putting walker in the car so I don't have to take it off and leave it at home! Allows me to put items on the tray and take them from place to place. Also wonderful for putting my food on it to take from kitchen to where I am going to sit and eat. It is like a spare pair o hands. I love it! what tray will fit a guardian walker # 07767? approximate 20 1/2 inches across button bar? Do you have a statioary, non flip, tray for a Guardian G30755P? 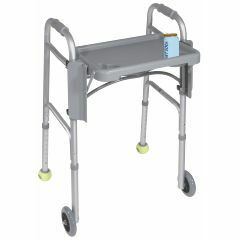 What tray will work for a Invacare walker model 6291? Will this fit/work on a invacare 6281 model walker ? WILL THIS TRAY FROM INVACARE FIT MEDLINE MDS86410?